COMPLETE! Thanks to your support, we have completed the Raise Worker Voice capital campaign. Join us on March 2, 2019, to celebrate the completion of the campaign. Continue to support our work going forward by becoming a monthly donor! In the face of all the attacks on workers, immigrants, Muslims, women, and other marginalized communities, CTUL leaders are ready take our organizing to the next level. We are inviting you to join us in forging a path to win worker voice with tens of thousands of low-wage workers of color across Minnesota through CTUL’s Raise Worker Voice Campaign. The goal of our Raise Worker Voice Campaign is to raise $1.65 million in two years to take our recent victories to scale. Dozens of CTUL allies and members are organizing within their networks to raise $1,000 – $20,000 through bake sales, house parties, and more, and have already gotten commitments for 33% of our goal! Click here for a list of the Individual and Organizational Founding Partners of the campaign. And read below for more details on the campaign, and for materials to organize your own event. Trump and the 1% have made crystal clear their intentions over the next four years – a full corporate take over of our government. Eight men own as much wealth as half of the population of the entire world. But apparently this is not enough. Trump’s proposed cabinet feels like a Who’s Who of Corporate America. And they are trying to distract us from this corporate take-over by scapegoating immigrants and low-wage workers. In the middle of all of this, CTUL leaders are winning real change: retail janitors organizing with CTUL just won a union, CTUL members are developing a plan to enforce the two of the strongest municipal paid sick days policies in the country, CTUL members are partnering with the Governor’s office to ensure that wage and hour laws are better enforced, and CTUL members prevented retaliation against workers after the Dia Sin Inmigrantes actions. We will not be stopped! 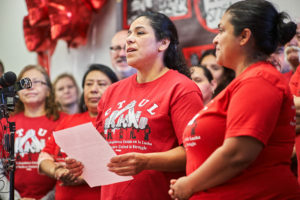 The guiding campaign for CTUL over the past six years has been the Campaign for Justice in Retail Cleaning – and workers won! The Twin Cities has become the first metro area in the country where the retail janitorial industry is union. Through worker-led victories in this campaign, we estimate that $5.5 million in additional income per year is invested in the poorest communities in the metro area. Now we are ready to take this victory to scale – winning a voice with tens of thousands of low-wage workers across the state, and reallocating tens of millions of dollars per year from the 1% back into the pockets of working families in Minnesota. Firmly establishing a low-wage worker-led organizing space with our new office in South Minneapolis. Drop by to get a sense of the power we are building at 3715 Chicago Ave. S.
Integrating arts and movement building with a mural on the outside of the building and rotating shows of community movement artists inside. “Twin Cities janitors declare victory in union fight after 44-month campaign,” article on the front page of The Guardian, Steven Greenhouse, October 13, 2016. “Striking against Trump,” Podcast by Sarah Jaffe interviewing CTUL member Luciano Balbuena and Co-Director Veronica Mendez Moore, January 24, 2017. Connect with us about organizing your own event: Brian Merle Payne, merle@ctul.net.